Coming from a long line of entrepreneurs and having started three businesses on my own or with family, I know the benefits and freedom entrepreneurship can bring. If you are wondering if you should start your own business check out this post with 9 advantages of becoming an entrepreneur. If you know you want to start a business here 13 proven ways to create a successful business. Have the desire to start a business or pursue an avenue of making money on your own. Have a general but useful idea that has demand or will have demand in the market place. Do research on the product, service, etc. Research, research, research. Study marketing. Learn how to market on multiple different platforms. The worst number in business is 1. If you only have 1 way of getting customers you could lose them if that avenue suddenly dries up or turns cold. Work. Put your ideas, research and knowledge into action. Incorporate. My businesses as well as most of my family members run their businesses as Limited Liability Company’s. LLC’s receive the tax benefits of a partnership but enjoy the liability protection of a corporation. You can do further research into what type of company you should become. When you have chosen the type you can contact your state.gov website and register. The website should walk you through registering a name, filling out required paperwork, and paying a fee (typically the fee is not too expensive). Keep working. Things like starting a business or manufacturing a product, or getting clients for a service based business often requires more endurance, patience, hard work, time, and money than one plans on from the outset. Don’t give up now. Keep going. Keep track of your finances. To begin, a simple spreadsheet of your expenses and your income will do. Once you start really making money, reaching out to an accountant/tax professional would be wise. Get a business bank account and a business credit card. Make sure to keep receipts and a mileage log from the get go. Don’t take money out of the business until you are extremely successful. Reinvest any money you make to keep growing the business. Set aside a certain amount of money just for marketing and be vigilant in trying to grow your customer base. Keep working and learning what you can about your industry. Test and improve your marketing. Smooth out the rough edges. Hire a contractor, virtual assistant, or an employee to help bear the load (when your business is becoming too much for you to handle alone and you can afford it). Be sure to consult with a tax/business professional before hiring actual employees. There are many laws associated with hiring employees. Also, be careful about who you hire. I wrote a blog post about the Top Proven Ways to Get Hired. 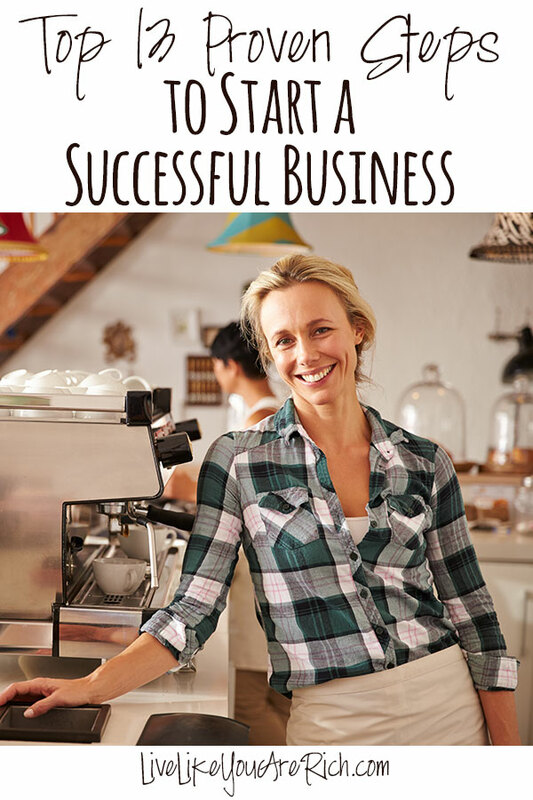 I share my tips on what to look for and some tips and tricks for business owners. There are times when investments are called for. It is important to invest wisely, be prudent, innovative and frugal. Many businesses fail due to mismanagement of money. Do your best to stay in the black. Be vigilant about online reviews and great costumer service. One horrid and descriptive review can hurt you immensely. Do your best to ensure that your customers are satisfied. It is almost never worth it to sacrifice money or time for your reputation—in the long run. Follow these steps and you will be on your way to enjoy the 9+ advantages of starting your own business. For other DIY and money-saving tips please subscribe, like me on Facebook, and follow me on Pinterest. My husband started his own business in January. Fortunately we had some savings and have found other ways to make money, because we have decided not to take out money quite yet. Running a business takes a lot of commitment and perseverance, but it can be a wonderful way to break out of the mold. It’s not for everyone! That’s awesome that you started a business. Yes it is a lot of commitment and dedication! I was so nervous to start my business as a dyslexia tutor, but I am so glad I took the leap. It is the best job for me right now. It lets me do what I want in the hours that work best for me. It might be scary, but it’s worth it. It is a lot of work though, so I don’t know how people do it if they use their own business as a full time job. Amy- that is awesome that you took the leap. I have a few people in my extended family with dyselxia. It’s awesome that you tutor! Thank you for the advice. I want to start a business but there’s so many fears. I like positive stories of people making it through adversities. Mona, go to a website called MicroMentor, they help people start their own businesses. It’s free! i started my business 2 years ago on youtube. the first year was rough but now im making enough money to live on it. thanks for this article.